Osmosis: DNA synthesis inhibitors: Metronidazole. (2019, April 20). 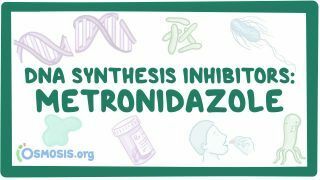 Retrieved from (https://www.osmosis.org/learn/DNA_synthesis_inhibitors:_Metronidazole). Metronidazole, marketed under the brand name Flagyl among others, is an antibiotic and antiprotozoal medication. It is used either alone or with other antibiotics to treat pelvic inflammatory disease, endocarditis, and bacterial vaginosis. It is effective for dracunculiasis, giardiasis, trichomoniasis, and amebiasis. It is the drug of choice for a first episode of mild-to-moderate Clostridium difficile colitis. Metronidazole is available by mouth, as a cream, and intravenously. What is the drug of choice for Dracunculiasis?